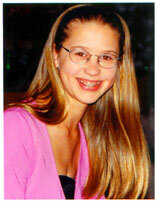 Kristin Kay Smith, October 1, 1986 – December 29, 2000. Kristin was a beloved member of our family who was unexpectedly called to her heavenly home in late December of 2000 following an automobile accident while enroute from Arizona to Disneyland. Although she was only 14 years old, she touched many lives through her poetry and participation in the performing arts. As you can imagine, she is missed tremendously by her family and friends. We hope this site will provide those who knew and loved Kristin with warm memories and be an encouragement to others who are or will someday be grieving the loss of a loved one. The tabs in the blue box above will take you to the links for other pages to learn more about Kristin, the Memorial Fund, and scholarships set up in her memory. The green boxes to the right contain links to the current guestbook and the guestbook (forum) from the old site. The forum from the old site is also archived by month. Please consider signing the guestbook and letting me know that you visited. It means a lot to me, thanks. Also, you can post comments on many of the pages. I will be updating this site and adding content. You might want to check back occasionally or sign up for email notification. Thank you to those who have purchased the Entertainment™ books. At least 30% of the purchase goes to the Kristin Kay Smith Memorial Fund. Click on the image or go to the Memorial Fund tab above to order the 2018 Entertainment Book. HELP PLEASE: If you do online shopping or searches, you can help raise funds for the Kristin Kay Smith Memorial Fund without costing you anything! Click on the image to sign up!